* This can be found in Options -> Interface -> Game Overlays, and selecting "8bit" in the dropdown menu. * The 8-Bit HUD can only be used until the end of the 4.3.4 patch. 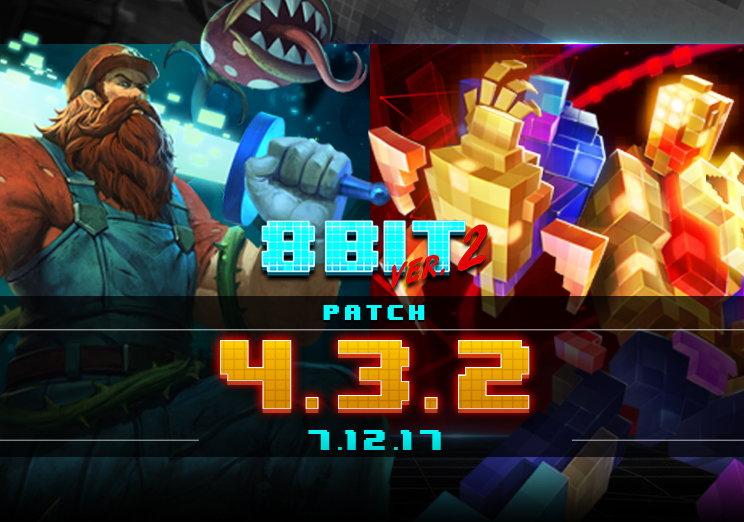 - The 8-Bit Render Mode has made its way back into Newerth! * A button will be available in the top bar of the main interface to toggle the in-game graphics to 8-Bit Render Mode & regular mode. + The electronic realm of Arcadia has been sealed away from the passage of time for decades due to a defensive shield coded by the Quarter Masters. This shield had kept them isolated and safe from the chaos of Newerth, until 8-Bit Kane accidentally sliced through the power cord during his headstrong rush through the shield to join the fray. Now all the characters of Arcadia are free to roam Newerth while the Quarter Masters duct-tape the cord, jostle consoles and blow into cartridges in a frantic attempt to reactivate the shield. - Puzzler is in a constant state of agitation as he tries to figure out exactly where he fits in this crazy new world of Newerth. Back in Arcadia, everything was in its proper place, connected and aligned perfectly -- but this chaotic realm has him all sorts of discombobulated with tiles and segments floating and scattering everywhere, even spinning as if controlled by some other entity. He's seriously topped out with all of this disorder and the chain reaction of destruction it's causing around him. Puzzler is determined to do whatever is necessary to find his way back to Arcadia where he can re-stack himself, eliminate all of these S and Z pieces that cause so much trouble, and enjoy a quiet life as a wall. - Plumb Crazy Zerker used to be a quiet, humble pipefitter in the land of Arcadia, maintaining the infrastructure that kept the shield operating smoothly for the Quarter Masters. When he heard rumors that Big Boss Bubbles had kidnapped a beautiful princess and all the other heroes were too busy collecting rings, coins, or whatever trinket they coveted to help, he decided to take matters into his own hands. He quickly discovered that even though he was an excellent plumber, he was even better at rescuing damsels and smashing everything that got in his way, particularly evil mushrooms. Now that he's in Newerth with no shield to maintain he can focus entirely on his new career as a gallant hero, and it's good thing. This place has an entire Legion army that needs rescuing! - Teleport every one of your precious pixels in dazzling 8-Bit II style! - Newerth is in absolutely NO shape for the winter holidays -- it's covered in siege rubble, scorched crops, and you can't dash ten feet through the snow without tripping over a frozen corpse. This is why Christmas Solstice is working day and night to decorate the land with festive ornaments, lights, garland, and all-around Christmas cheer. She's more than happy to share all of her decorations as she hurries from dawn until dusk -- even giving up the Christmas cloak on her back -- and so it is when night falls, she's often left with very little to keep herself warm. This usually works out just fine, as that's when the best holiday parties start to heat up and Christmas Solstice can replenish her stockings with another day's worth of holiday fun! - The legend whispers that it was miserable starvation, cannibalism, and eventual insanity that brought about the hideous creature known as Dampeer. But as the ancient daemons spill forth from All Hells and the Third Corruption, new, terrifying truths are surfacing with them. Vampeera is one of the original vampires, and her bloodthirsty reign pre-dates even Man's Fall from Light. She has been stalking and terrorizing the living for millennia, converting them into drained sacks of flesh and bone or servants to gather her feasts and spread her carnage -- whatever her whims and appetites call for at the moment. Captured and banished to All Hells by the Blind Prophet and his Disciples, she is now unleashed to renew her destruction. And she is very, very thirsty. - Tooltips now display the proper information for Empath's and Emerald Warden's Staff of the Master effects. - Friend List tooltips: changed "Ignore" to "Reject" when deciding to accept or deny the friend request. - Orb visuals from Consume now match the charge count after Dampeer revives. - Clearcutting's instance of bonus Movement Speed (when cutting a tree) now applies to Deadwood properly for the Plushie Deadwood and Misfit Deadwood avatars. - Sandstorm's Movement Speed Slow no longer bypasses Magic Immunity. - Vanishing Woman avatar now has proper bones for visual effects. - Tooltips now properly mentions the Cleave information. - Cast Range indicator is now displayed properly.